Yes, we can? Yes – he did. 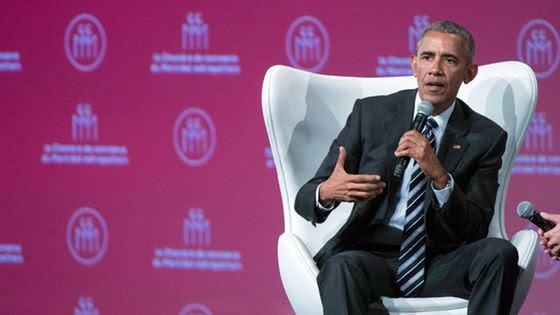 This past week, I was fortunate enough to be invited to hear Barack Obama speak in Montreal. He emerged after taking a much-needed break from having one of the biggest jobs on the planet. I was struck by many of his many comments and it’s challenging to describe here all that was shared. There a few key themes that describe the world we are currently living and working in. There is more disruption than ever in the history of our time. It involves multiple concurrent elements including globalization, mass migration, technology, artificial intelligence, politics, wage stagnation, ISIS, Brexit, and the increase of women’s education and roles. The hunger for leadership across the world has never been more palatable. With all of the challenges and opportunities that exist, there is an incredible need to be led and this can be done out of fear or hope. The danger is to see this time of disruption and change in a negative light, especially with the constant negative opinions that are often being published by the media, pundits, and political leaders. There have never been more challenges and yet, paradoxically, more opportunity. To me this final point is key. What story are you currently telling yourself about the world, the economy, and your current personal and professional situation? The great opportunity that you and I have is to redirect our paths and improve our situation, and that of the environments around us.